Your body needs a well-balanced diet to stay healthy and energetic. But if you are an athlete, you need a diet that supports a higher level of physical activity by boosting your energy, immunity and muscle strength. A poor diet not only affects your athletic performance, but it can expose you to health complications. The right combination of foods can boost your energy levels and keep your levels high for longer. 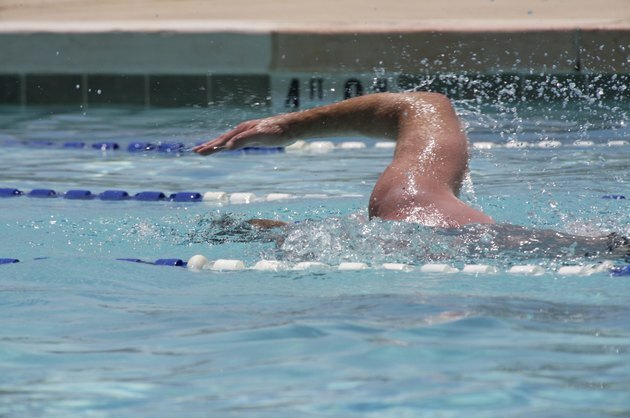 Swimming is a strenuous activity that requires muscle health and strength. Vitamins and minerals boost your immunity and aid in energy production. For example, your body needs the B vitamins for energy. Vitamins B-1 and B-2 help your body produce energy, and they affect the enzymes that influence your muscle, heart and nerves functions. Deficiency of some B vitamins can result in muscle cramps, tiredness and loss of appetite, according to American Cancer Society. Vitamin C acts as an antioxidant, and it protects you against free radicals, which can cause disease. Also, minerals play a significant role in your performance. Iron carries oxygen to all cells of your body, and calcium improves your bone health and muscle function. Water is a crucial part of your diet as an athlete. Because your body does not make or store water, you must replace what you lose through sweat and urine to avoid dehydration. Drink water before, during and after training without having to wait to feel thirsty. By the time you feel thirsty, your body will have lost about 2 percent of its weight, which can affect your performance, according to OrthoInfo, the patient information website of the American Academy of Orthopaedic Surgeons. While everyone should drink at least eight cups of water every day, an athlete requires more. Dehydration can cause overheating and fatigue. Carbohydrates provide your body with 40 percent to 50 percent of your energy requirements in the early stages of moderate exercise. Eating a diet that provides 70 percent of your calorie intake from carbohydrates three days before a big competition can help boost your endurance. Also, choosing whole grains over refined starches protects you against energy lags; whole grains have a low glycemic index, and your body absorbs the sugars slowly for lasting energy, according to the Harvard Health Publications. Examples of whole grains include whole-wheat bread, oats, cereal and whole-grain rice. For general training needs, you require 2.2 to 3 grams of carbohydrates per pound of your body weight. Endurance athletes need up to 4.5 grams per pound of body weight. Your body needs proteins to build new tissues. The amount of protein your body requires depends on the intensity and duration of your exercise. If you are a competitive swimmer, you require 0.5 to 0.6 grams of protein per pound of your body weight. Sources of animal protein include poultry, meat, eggs, dairy and fish. Vegetable proteins include legumes and nuts. Eating protein in excess of your body's needs is unnecessary; the body stores excess protein as fat. Breakfast in an important part of an athlete’s diet. A healthy breakfast replenishes your glycogen levels – the stored form of glucose – which may be a bit low after sleeping. Start fueling your muscles with energy earlier in the day to avoid an energy slump and decreased physical activity. It is equally important to eat foods that contain good fats such as peanuts, avocados, olives and walnuts. Avoid solid fats such as butter and lard, and instead, replace them with vegetable oils. Your total fat intake should be between 20 percent to 35 percent of your total energy intake.